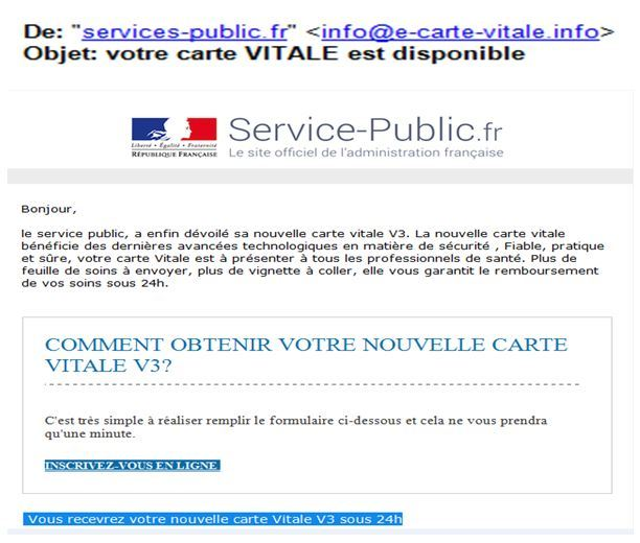 Look out for scam emails about the Vitale V3 card with the Service-public.fr or Ameli logo inviting you to download a form to obtain the new card within 24 hours. This is a fraudulent mail to encourage users to reveal their personal data. These fraudulent emails claim to be from the service pubic or the assurance maladie site, displaying the logo and the website link. In reality, the link takes you to a website that looks similar to the services-public or ameli site, but is actually a fraudulent site, set up to obtain bank and credit card information (ID cards, passport, driving license, residence permit …) and home details (electricity bill, gas, telephone …). Attention! This is an online scam called phishing. In no circumstances should you answer it! DO NOT REPLY. DO DELETE THE EMAIL. If you have already submitted your bank details, contact your bank immediately. The assurance maladie reminds you that it would NEVER ask for these kind of details on line. Phishing’ is the sending of a fraudulent email falsely claiming to be an established business, in order to obtain personal details (bank accounts, passwords), which are then used for identity theft. You can check whether a site is fraudulent by double-clicking on the padlock at the bottom of your screen, which will bring up details of the site certificate. No genuine bank, building society or public service will ever ask you for personal details by email. For more information on this piracy and how to protect yourself, visit ANSSI (Agence nationale de la sécurité des systèmes d’information) for tips and info on computer security. What do you call a Frenchman wearing sandals?